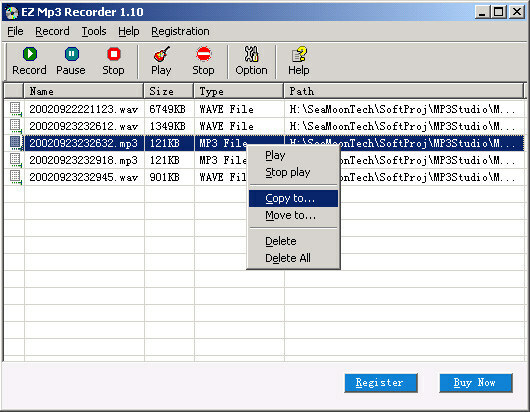 EZ Mp3 Recorder makes a complete recording studio of your computer. With EZ Mp3 Recorder you can record your own music, voice or other sound you hear, either voice from microphone, webcasts from the Internet, music played by Winamp, Windows Media Player, Quick Time, Real Player, Flash, games, etc. Sound quality of the recordings remains excellent, or sounds even better for EZ Mp3 Recorder reduces noise. ...... EZ Mp3 Recorder is able to automatically detect the recording formats your sound card supports and then set the application's parameters for the best possible performance. Your recordings are then saved as mp3 or wav files. * Record any signal played through your sound card into Mp3 or WAV files. * Produces recordings with CD quality. * Play mp3 & wav files directly with this utility. * Easy to use, just click a few buttons to record. * Free lifetime upgrades and technical support. Qweas is providing links to EZ Mp3 Recorder 1.70 as a courtesy, and makes no representations regarding EZ Mp3 Recorder or any other applications or any information related thereto. Any questions, complaints or claims regarding this application EZ Mp3 Recorder 1.70 must be directed to the appropriate software vendor. You may click the publisher link of EZ Mp3 Recorder on the top of this page to get more details about the vendor.